Social mobility has been a problem in UK society for decades, and 69% of young people believe that a ‘class ceiling’ is holding them back in their careers. The good news is that the future is looking brighter thanks to the Social Mobility Pledge, which now covers over a million employees in businesses across the UK. 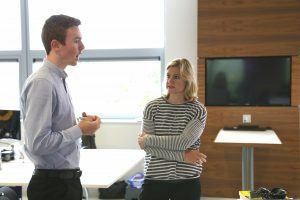 Launched earlier this year by the Harrison Centre for Social Mobility and former Secretary of State for Education Justine Greening MP, the pledge commits an employer to progressing talent from all backgrounds. Here at True Potential we proudly got on board as one of the first companies to sign the pledge. Employers who have signed up so far include John Lewis, Marks & Spencer, Vodafone, ITV, BT, Adidas, Penguin Random House and Thomas Cook. The premise is simple, to support people from all backgrounds through education and training. Things like accents or where you started out really shouldn’t matter in business. That’s why the Social Mobility Pledge supports recruitment processes that are open and fair to all. At True Potential we’ve always been a big believer in young people, and we have an excellent track record in helping the next generation of talent emerge through apprenticeships and our academy scheme. Where you’re coming from isn’t a factor in our business, it is all about your ambition in the now. Our Managing Partner, David Harrison, exemplifies what social mobility can achieve. He started out in a pit village in County Durham. “Like many of the people I grew up with, I probably would have had to find work down a coal pit in the late sixties and seventies,” David said reflecting on his start in life. However, through his ambitious entrepreneurial streak, he carved out his own social mobility journey and has made a hugely successful Fintech business at True Potential. He’s now giving back as a philanthropist, through the Harrison Centre for Social Mobility and partnering with Justine Greening on the Social Mobility Pledge. -True Potential has partnered with the Beacon of Light School in Sunderland. It promotes education by delivering groundbreaking programmes to improve learning via engaging purpose-built classrooms, innovative teaching techniques and interactive spaces. -A group of five apprentices are now gaining valuable experience at True Potential, learning key IT and digital skills. Several former apprentices now have full time employed roles at True Potential. -Working in partnership with our recruitment agencies, individuals’ names are removed from CVs before they reach us. This places a greater emphasis on a candidate’s complete background and achievements when assessing their suitability for the roles we offer at True Potential. Learn more about the Social Mobility Pledge.